Air pollutants in the Imperial Valley impact the public’s health and can be exceedingly dangerous to young ones, elderly, and those living with certain medical conditions. These pollutants can cause a variety of lung diseases and respiratory problems including emphysema and asthma, as well as inducing brain and nervous system damage. Air pollutants also affect those with chronic allergies by irritating the eyes, nose, and throat, and even causing rashes or hives. Every year, our local hospitals and clinics are overwhelmed with patients complaining of respiratory issues, exacerbations to asthma, chronic coughing and such. Residents of the Imperial Valley have come to expect this as a result of living here. Many are referred to local specialists or over the mountains to San Diego professionals. Some have even made the decision to relocate permanently. According to CaliforniaBreathing.org, approximately 23,000 people in the Imperial County have been diagnosed with asthma; 28% of which are children under the age of 18. Asthma is a chronic disease that inflames airways and causes recurrent wheezing, coughing, difficulty breathing, and chest tightness. Asthma attacks can be mild to deadly. The Imperial County has the highest rate of both emergency visits and hospitalizations for asthma among school-age children in the state of California. Speaking from personal experience, living with asthma is very burdensome. Leaving the house without an inhaler is not an option. When the air quality is low, it can be very hard to try to catch your breath throughout the day. When I was younger, nebulizer breathing treatments were very common for me. The nebulizer machine was extremely daunting for me because it was loud and had the tendency to make me feel jittery and shaky. Asthma is very common in my family, affecting my older cousin, my younger sister, my grandfather, and myself. I also live with chronic severe environmental allergies. As a child, I was tested for all sorts of different irritants, and came up positive for almost all outdoor allergens. Upon consultation with an asthma and allergy specialist, I was informed that I am living in the worst possible area for a person with allergies and asthma. The only solution for this would be to move out of this geographical area. I can’t imagine how many others in the county suffer from the same dilemma. The Imperial County offers a website program that individuals with chronic respiratory issues can utilize free of charge to check when air quality throughout the Imperial Valley is at unsafe levels. Alerts can be sent via email, text, or cell phone. The website to sign up for these alerts is: http://www.imperialvalleyair.org/airalert.cfm. Air pollutants in the valley arise from many different origins, including local agricultural fields, Mexico, and the Salton Sea. The Salton Sea has become one of the largest problems in Southern California. The Sea has progressively been shrinking for years now and it’s shoreline is expected to recede between three and twenty feet more in the near future. As the Sea continues to evaporate, it is exposing its toxic floor. Arsenic, selenium, chromium, zinc, lead, and pesticides, including DDT, an insecticide that has been banned for nearly forty years, are all found on the lake bottom. If the Salton Sea were to completely dry up, all of those pernicious chemicals would be exposed. At least 21,120 acres of sediments would be at the mercy of hot, dry, desert winds. These tiny particles could then be inhaled by individuals and pose as a deadly health hazard. Dust blown from the Salton Sea could reach from the Imperial County to the eastern Riverside County and beyond. This dust would be a much greater problem and cause more harm to residents than the Owen’s lake incident in the 1920’s. Since the Imperial Valley is predominantly an agricultural community, the area is flat, dry, and open with few trees to buffer the impact when high winds blow. 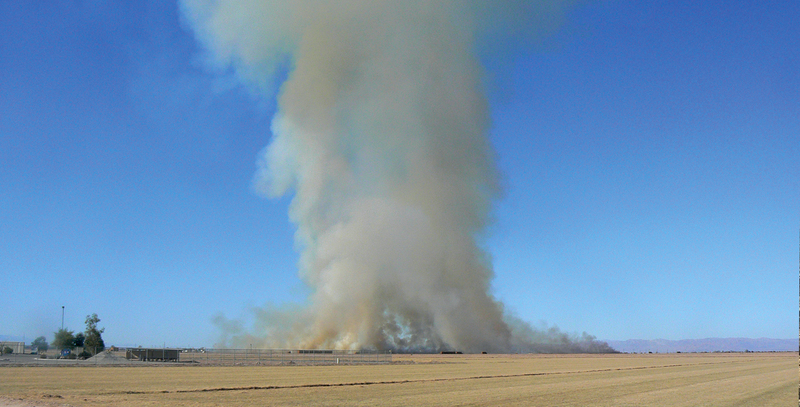 Everyday, fields are burned which blows smoke, pollen, dust, and fumes of burning pesticides into the air we breath. Fine dust and soil from empty abandoned fields also enter our air supply with even the slightest breeze. In the early 1950s, air pollution management was initiated to help reduce the effects of pollution on residents in California. Today there are over one hundred air monitoring stations in the state of California. In the center plaza of Brawley Union High School, there is an air quality flag that is changed every single day according to the data from imperialvalleyair.org. There are small steps being taken to help inform the community about the quality of our air from day to day. However, not much is being done to eliminate pollutants in the air. The County of Imperial has mandated that all dirt roads should be watered down in order to prevent excessive dust, as well as any vehicles driving down roads along fields must follow a strict slow speed limit as to avoid working up dust. If you asked me how important I thought it was to take steps in improving our air quality in the valley, I would say that it is crucial that we, the Imperial Valley, as well as the bordering counties, work together in addressing the current exacerbations along with any future issues that may arise. Being that we are one of the top agricultural areas in the state of California, we need to make the appropriate improvements for the future of agriculture as well as the safety for those residing here. With the support of these air quality alerts, county rules and regulations, Department of Motor Vehicles regulations, and local healthcare resources, we can join forces in improving the condition of our air and educate our community in the importance of it. If nothing is done about our air problems, citizens of the valley will eventually be driven out permanently due to major health problems that will without a doubt arise. The author, Emily Swaim, is a senior at Brawley Union High School, and is an avid outdoor lover. She is also a member of the National Society of High School Scholars and the Brawley Chapter FFA. She plans to continue into higher education with the goal of becoming a veterinary technician.